An explosion of white and pinkish tones with red banding and sprinkles of crimson turn these petals into raspberry fireworks. 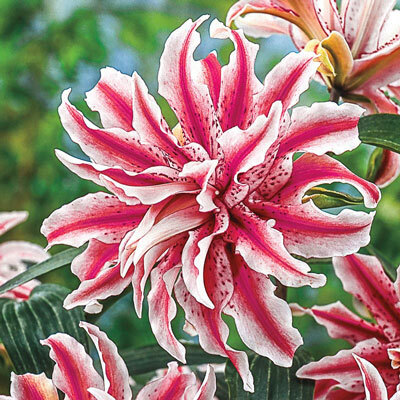 The large 9-12" double flowers are very unusual for lilies, and will fill your garden with the fragrant aroma of sunny beaches and tropical nights. Leave fully hardy bulbs in the ground for increased beauty the following years.